Give the gift of footwear and save with some of our favorite challenger brands. 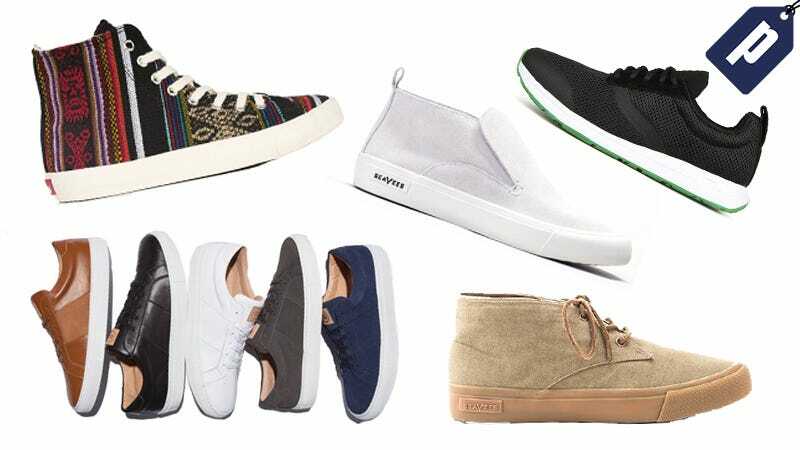 From high tops and chukkas to slip-ons and athletic trainers, there’s something new for everyone to step into. Prices start from $59. Inkkas is ready to breathe new life into your sneaker collection with their uniquely designed hand-made shoes inspired by cultures and landscapes from around the world. Grab a pair now, like the popular Blackbird High Top for $52. Save 30% with promo code BLACKFRIDAY. Plus shipping is free on orders of $90 or more. Discount not available on clearance products. SeaVees’ Huntington Middie is a new type of slip-on with a mid-rise upper that captures the quintessential surf style—modern, simple and comfortable. Features a soft-suede upper and signature herringbone rubber outsole for all-day comfort. Fits true to size. If between sizes, we recommend going up a half-size. Greats Sneakers were born in Brooklyn on the direct-to-consumer model with a plan to shake up the sneaker-to-store inventory flow. The Royale collection is classically inspired and handcrafted in Italy with full grain leather and Vachetta calf vegetable tanned leather inside, making socks optional. Prices on site are already discounted and final. Prices start from $129. Huckberry teamed up with SeaVees to create an exclusive Chukka that puts a California casual twist on the classic shoe. Duck-canvas upper, and a vulcanized gum rubber sole make a casual but rugged shoe that’s ready for everyday wear. Buy today and save over 15%. A lightweight durable trainer with a “racing shoe feel” built by YORK Athletics Mfg. for everyday running. YORK used a full ground contact solid rubber outsole for traction, durability and a seamless heel to toe transition. Fits true to size; order your usual sneaker size. Buy today to save 30% and get these for $77, plus earn an additional 10% back in Huckberry-Credit on future purchases.